In his attempt to shed the Hindu hardliner image, BJP President L.K. Advani today paid homage at the mausoleum of the founder of Pakistan, Mohammad Ali Jinnah, becoming the seniormost Indian politician ever to do so since the sub-continent’s partition. Stating that a number of confidence-building measures were in the pipeline to propel the peace process with Pakistan, India today nevertheless made it clear that much would depend on Islamabad honouring its commitment to stop cross-border terrorism through “concrete actions”. Saddam Hussein’s morale has plummeted due to the gravity of the war crimes charges he faces, according to the judge trying him. British explorer Ranulph Fiennes has failed in his bid to become the first person to cross both polar ice caps and climb Mount Everest after being forced to abandon his ascent of the world’s highest mountain today. Children living closer to high-voltage overhead electric lines may be at an increased risk of leukaemia, scientists have said. An African woman convicted in Britain for child cruelty, involving a schoolgirl beaten with a high-heeled shoe, insisted that victim was a witch. 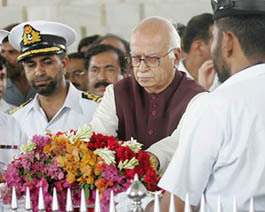 Mr Advani, who sought to disassociate himself from the Sangh Parivar’s pet ‘Akhand Bharat’ (indivisible India) theory two days back by declaring the emergence of India and Pakistan as an “unalterable reality of history”, placed a wreath at Jinnah’s ‘mazar’ to the sounding of bugles by Pakistani navy personnel and stood in silence as a cleric offered Al-Fateha (prayers). “There are many people who leave an inerasable stamp on history. But there are a few who actually create history. Qaed-E-Azam Mohammad Ali Jinnah was one such rare individual”, the Leader of the Opposition wrote in the visitors book at the mausoleum, which he visited with his family amid unprecedented security. In a similar gesture, then Prime Minister Atal Bihari Vajpayee had paid homage at Lahore’s ‘Minar-e-Pakistan’ following his historic bus journey in February 1999. However, some Islamic fundamentalist group had washed the monument after his visit to register their protest. Recalling that freedom fighter Sarojini Naidu had described Jinnah in his early years as an “Ambassador of Hindu-Muslim unity”, Mr Advani reminded the people of Pakistan that their father of nation favoured a secular state vis-a-vis the Islamic state it was now. The BJP chief said Jinnah’s August 11, 1947, address to the Constituent Assembly of Pakistan was really “a classic, a forceful espousal of a secular state in which while every citizen would be free to pursue his own religions, the state should make no distinction between one citizen and another on grounds of faith. My respectful homage to this great man”. Mr Advani today took a trip down memory lane when he visited his alma mater here and stressed on the need for paying more attention to education. In other confirmed incidents, water balloons thrown by prison guards caused an unspecified number of Korans to get wet, a guard’s urine came through an air vent and splashed on a detainee and his Koran; and in a confirmed but ambiguous case, a two-word obscenity was written in English on the inside cover of the Koran. The findings, released after normal business hours last evening, are among results of an investigation last month by Brig-Gen Jay Hood, commander of the detention centre in Cuba. The probe was triggered by a Newsweek magazine report, later retracted, that a US soldier had flushed one Guantanamo Bay detainee’s Koran down a toilet. The story stirred worldwide controversy, and the Bush Administration blamed it for deadly demonstrations in Afghanistan. The man leading the trial against Saddam, Raid Juhi, told the London-based Asharq al-Awsat newspaper in an interview that the ousted President and some of the 11 other detained former regime figures are facing 12 cases carrying punishments from life in jail to the death penalty. “The ousted President has suffered a collapse in his morale because he understands the extent of the charges against him and because he’s certain that he will stand trial before an impartial court,” Juhi was quoted as saying. Saddam, who is being held in a US-run detention facility in Baghdad, was captured in December 2003 and faces charges including killing rival politicians during his 30-year rule, gassing Kurds, invading Kuwait and suppressing Kurdish and Shiite uprisings in 1991. No date has been set for the start of Saddam’s trial, but Juhi reiterated comments made last week by President Jalal Talabani to CNN that the former dictator was expected to face the tribunal within two months. Saddam will be tried alone in some case and along side other detainees in other cases. Saddam’s lawyer, Khalil al-Duleimi, rejected Juhi’s comments, telling the Associated Press that his client was in high spirits and that he was not aware of the 12 cases the judge referred to. Fiennes, 61, — also known as Ran — was forced to turn back because of ill health 30 minutes after he had left the top camp 8,400 metre (27,560 ft) up the mountain for an assault on Everest’s summit. “So far, we have a few details of summit night but know that Ran made the call to turn round and descend, shortly after the team left the top camp,” an update on the Jagged Globe Team’s website said. It added that the explorer was now making his way down the 8,850 metre high mountain accompanied by his Sherpa. Fiennes, who has confessed to the fear of heights, was attempting to climb Everest’s more difficult north face to raise money for the British Heart Foundation (BHF) charity. He himself had a near fatal heart attack two years ago. “He was really concerned for his health. He decided he was just pushing himself too hard,” team spokesman Tom Briggs told the BBC, adding that weather on Everest had been appalling. Researchers have found that youngsters living within 200 m of power lines were about 70 percent more likely to develop leukaemia compared with those who lived beyond 600 m, according to the Scottish daily The Scotsman. Those who live between 200 m and 600 m of the high-voltage power lines also have about a 20 percent increased risk. The study published in the British Medical Journal studied more than 29,000 children with cancer, including 9,700 with leukaemia, born between 1962 and 1995. Some researchers have suggested that low frequency magnetic fields, such as those caused by the production of electricity, could possibly be linked to cancer. Sita Kisanga (35), and her brother Sebastian Pinto were found guilty yesterday by London’s Old Bailey Court of aiding and abetting abuse committed by the eight-year-old’s aunt after the women became convinced the girl was involved in witchcraft. ‘’I know it is not easy for people to believe but those people with the spiritual belief will know what I’m saying is true,’’ Kisanga told the BBC in an interview aired today. After their conviction, Kisanga and the girl’s aunt were warned by the judge they would face ‘’a lengthy time in prison’’ when he passes sentence on July 8.